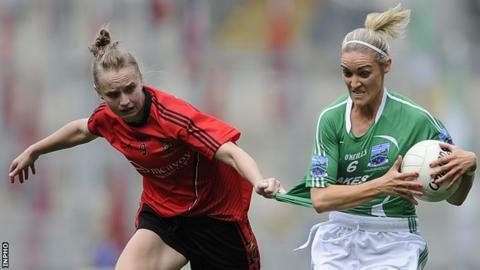 Down ladies footballers routed Fermanagh 6-16 to 1-10 in the All-Ireland Intermediate Final. The Mourne women took control after a ninth-minute goal by Aileen Pyres. Lauren Cunningham's goal increased Down's lead to 2-6 to 0-2 and a Lisa Morgan penalty left the margin at 3-6 to 0-6 at half-time. Sinead McNamee hit Down's fourth goal and after Caroline Little's Fermanagh goal, Kyla Trainer notched two further Mourne goals in the Croke Park final. Down's victory secured a return to the senior ranks for Mark Copeland's side who got the better of the Erne women for the third time this season. The sides were tied after six minutes following a Noelle Connolly point, but this was as close as it got for Fermanagh as Pyres registered Down's first goal three minutes later. Cunningham bagged Down's second goal after 19 minutes to open up a 2-5 to 0-2 lead. While Fermanagh rallied before the break with Aisling Moane, Joanne Doonan, Danielle Maguire and Connolly on target, Morgan's penalty helped Down take a 3-6 to 0-6 interval advantage. A chipped McNamee effort handed Down their fourth goal, and although Fermanagh netted through Little, the Mourne side weren't going to concede much and finished strongly with an unanswered 2-3 including a brace of Trainor goals. After the game Ladies Gaelic Football President Pat Quill presented Niamh McGowan with the cup. Meanwhile, holders Cork produced a remarkable late comeback to beat Dublin 2-13 to 2-12 in the senior final. The Dubs appeared certain winners as they led by 10 points with 15 minutes remaining but late goals by substitutes Rhona Ni Bhuachalla and Eimear Scally helped Cork clinch a dramatic victory.